Ideal for budget travellers, our guide to Koh Chang’s top hostels and dorms across all the beaches. Updated for 2017-18, information and chance to book. All the information needed on getting from Suvarnabhumi Airport to Koh Chang. Details, prices and chance to book private transfers as well as flight numbers, times to Trat Airport, bus/share minibus with Suvarnabhhumi Bupara Co or 999 Bus or our own share minibus. The Thai islands of Koh Chang, Koh Kood, Koh Mak and Koh Wai are located on the eastern side of the Gulf Of Thailand, sharing a maritime border with Cambodia. If you are planning a holiday in this part of the world, then look no further than these islands. From luxurious resorts to backpacker bungalows, beautiful beaches around each corner, restaurants, nightlife and a fantastic daily choice of things to do, Koh Chang, Koh Kood and Koh Mak have it all. Koh Chang the largest and most popular of the islands with deluxe hotels, boutique resorts or backpacker huts. 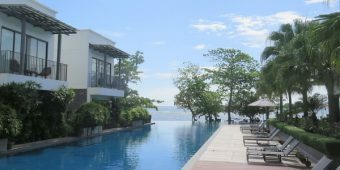 Fabulous beaches, diving and snorkeling, waterfalls, elephant trekking, jungle treks, offshore islands, massage and spas, restaurants and nightlife. Koh Kood, the second largest of the islands, with backpacker rooms, boutique and luxury resorts, white sand beaches and waterfalls, mangroves, huge old trees, diving and snorkeling, local fishing villages, speedboats, charming wooden piers, sunsets and tranquillity. Koh Mak, the family island, with small friendly resorts, backpackers huts, wild coasts, long sweeping beaches, cycling, kayaking, snorkeling, dive schools, forest walks, offshore islands, restaurants and relaxing bars. Koh Wai, the smallest of the islands, a handful of resorts and bungalows dotted along a coastal path, lovely white sand beaches, great snorkeling, electricity from generators, no shops or vehicles, escape and unwind. 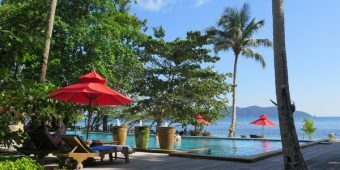 In our Koh Chang, Koh Kood, Koh Mak and Koh Wai Island Travel Guide, we take a tour around the islands and along the way, give you all the information needed for a perfect visit to this most beautiful of locations in Thailand. We have designed the guide so you can either browse in just one island area or you can hop onto the next. For Koh Chang, there are familiar guidebook style sections ranging from beaches to hotels, resorts and bungalows, restaurants and nightlife to things to do, how to get there and information, with of course, useful maps, all of which we hope will make those tricky decisions on how, where and when, just that little bit easier. 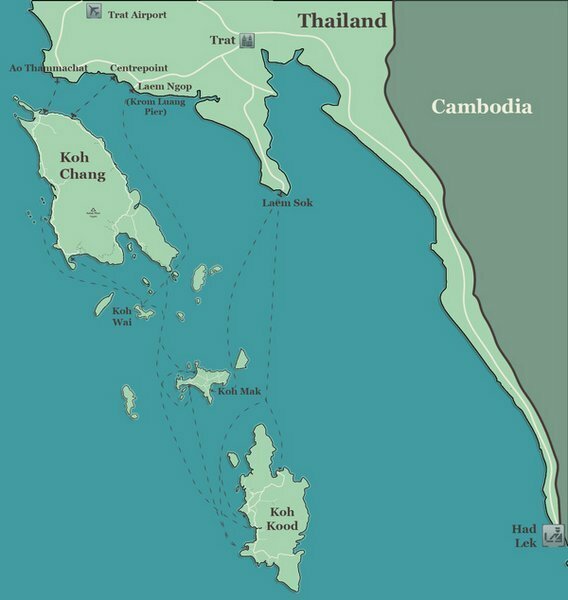 We repeat these sections for Koh Kood and Koh Mak and to a lesser degree for Koh Wai. 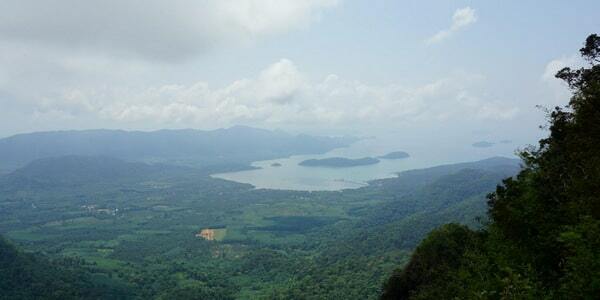 A day trekking in Salak Phet up the 650m Koh Laem peak, with its breathtaking 360 degree views of Koh Chang, followed by a descent via the top tiers of Kheeri Phet Waterfall. Our guide to Don Mueang Airport (DMK) in north Bangkok, home to the budget carriers such as Air Asia, Nok Air, domestic and International flights. All the travel tips needed into Bangkok by shuttle bus, public taxi and of course the best way to get to the Koh Chang Islands if landing here. Our complete guide to Suvarnabhumi Airport Bangkok with information on floor lay-out, travel into Bangkok by taxi, Khao San bus, shuttle bus to DMK or Airport Rail Link and all the details on getting to Koh Chang, flights to Trat Airport, private transfers, bus and minibus. A brief guide to private speedboat trips off Koh Chang. Visits to Koh Laoya, Koh Wai, Koh Klum and snorkeling at Koh Rang. Prices and itinerary suggestions. Our guide to private boat trips and snorkeling days out off Koh Chang – wooden boats and speedboats, where to go, Koh Rang and prices. Getting from Koh Chang to Siem Reap (Angkor Wat) and Siem Reap to Koh Chang. All the prices, tips on how to to avoid the scams, on what to expect at each stage as you cross the border, visa prices, minibus details and prices, share taxis and the chance to book private transfers. 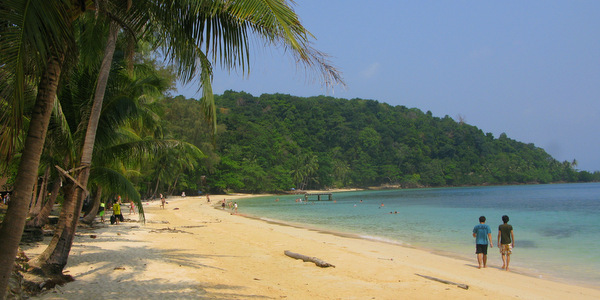 Koh Chang travel to or from Sihanoukville and Phnom Penh in Cambodia via the border at Had Lek. Information and tips, prices, times for public minibus travel, chance to book private transfers.